very-cute-puppy_04, originally uploaded by cloneofsnake. /// THIS JUST IN! See Hover pup hover! /// Download hoverpup.mov Nice work, Zaff! Ah! Whimsical. He almost looks like a whiff of smoke O_O What kind of puppy is that? Puppeh is SOOO HAPPEH! His eyes are squeeezed shut against the gusts of wind he's creating through his super-puppeh speed. Look at that smile! OMG, a little fluffy cloud with eyes and a shiney black, beepable nose! WANT! My puppehs used to hover... but then they starting wearing life-vests with handles and now they just want to be picked up and carried. geeze. Looks like a little cloud zooming by! I have NEVER seen ANYTHING look so definitively ^_^ ! It's the dog from before! http://mfrost.typepad.com/cute_overload/2007/09/thats-levitatio.html Where's his friend? OMG it IS the dog from before! Ehhhh... I preferred the old hoverpup photo. Although this one does have the fabled Animal-Crossing eyes! Mia, I think it's a Maltese. Some friends of mine have one and he's a great little dog. He has the personality of a big dog but likes to cuddle. I don't even remember how long it has been since I could do that! Sproing it is, little one! I think it is a Maltese or a Havanese. Too Cute- perhaps it should be a "World Peace Achiever?" Kinda looks like a mini version of Falcor (never ending story) Just get that spot I can never quite reach and I'll fly anywhere. Its a bird. No, its a plane. It looks like "the Holy Moment" scene from Waking Life -- only it's the puppeh version! And here I was thinking all dogs cast shadows. its shadow is racing to keep up, buts its also having fun too. More photographical proof of Leland Stanford's theory that at some point, all four legs of a quadraped leave the ground when running. Thank you, Eadward Muybridge! Love this happiest of pups! you can land on me !!! I made it!!!!!!! I made it!!!!! No shots at the Vets!!!!!! I want to be as happy as that lil' dude!!! W00t! Reminds me of our Gracie The Shrieking Beagle as a pup. She zoomed around so much we always thought she put a paw down only occasionally to stay in motion. The rest of the time she was totally airborne (ok, it SEEMED that way). I saw a foal pace like that once - just floating in the air with a tiny hoof put down occasionally for propulsion. . . so joyous! Great name for a beagle, by the way! ITS KRYPTO THE WONDER DOG! Looks like a maltese to me! Wot Woot sure looks cute. Gracie The Shrieking Beagle's official name was Grace Hopper Beaglemix. She got her other name because of her bat-crashing vocalizations. looks just like my Maltese Duke! Wonderful little fella - everyone should have such joy in their lives!! 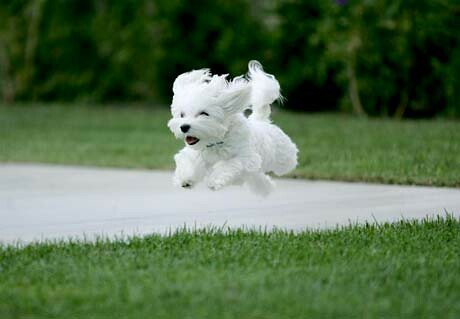 Bichon Frise--known in the circus as "The Flying Cottonballs".